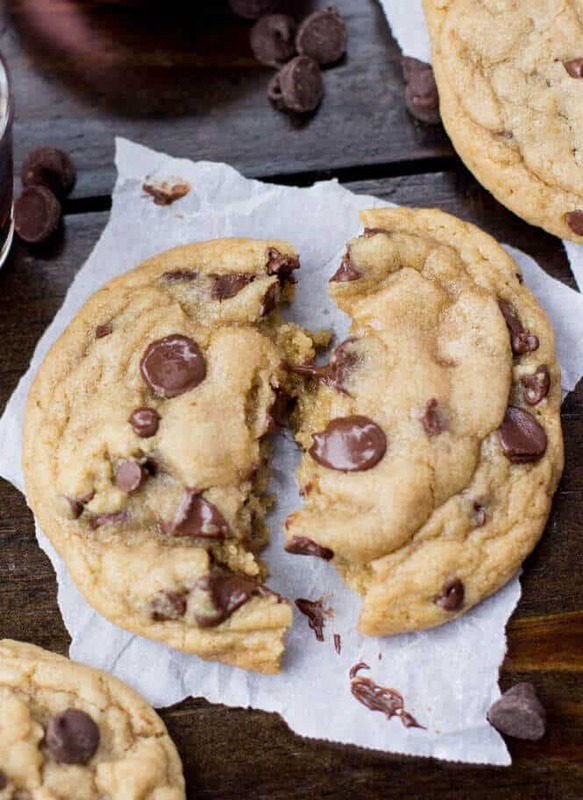 Go no further, these chocolate chip cookies will ruin your life. I can only assume something must have gone horribly wrong to bring you here today. 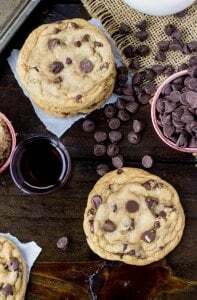 Amidst a cherry-picked Pinterest Sea of “perfect chocolate chip cookies” a Google Forest of “best ever chocolate chip cookies”, and dog-eared cookbooks of “award-winning” and family favorite chocolate chip cookie recipes, you have somehow found yourself here, face-to-cookie with the “worst” chocolate chip cookies. I know what you’re probably thinking: It’s just a cookie, right? 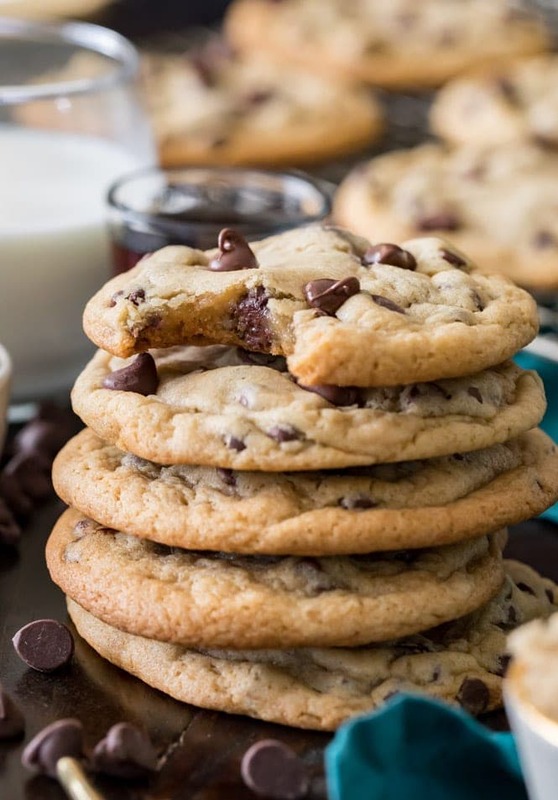 I mean, they look innocent enough, golden with melty chocolate chips, crinkled edges and melt-in-your-mouth interiors… but one bite and you’re ruined for life. These cookies will consume your life, shrink your jeans, and steal your boyfriend (I wouldn’t put it past them, anyway). They even contain a secret ingredient. How obnoxiously cliché, and, even more obnoxiously, intriguing. I won’t drag it out, the secret ingredient is maple syrup. Sure, pure maple syrup (priced per ounce nearly the same as gold) would be just wonderful. But, if you have a sticky bottle of Aunt Jemima in your cabinet (as I did), that will work just fine, too. What kind of self-respecting cookie doesn’t demand purity and quality? Only the worst kind. I credit this “secret ingredient” for being the greatest offender in this recipe. 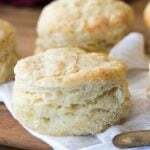 It gives the cookies a subtle, caramelized flavor, as well as long-lasting chewiness and softness (these cookies stay soft for days, the cornstarch also helps with that significantly), and the flavor is to die for. And while anyone who takes a bite will be able to detect the extra richness of flavor, no one who I shared these cookies with was able to identify any sort of secret ingredient. Just “really, really, good cookies”. OK, so what’s so bad about really really good cookies? How about the fact that they will consume you as you consume them. I’m not kidding about them wrecking your relationships. Mom’s favorite chocolate chip cookie? Ditch it. You will snub your nose at every “favorite” cookie of the past and struggle to hold back scornful laughs at anyone who comments on a “delicious cookie”. Nobody likes a cookie snob, but you will become one. Here comes that girl again, the one who’s too good for Chips Ahoy. Be prepared for weight gain. It creeps up slowly, the cookies gently embracing you at first, then clinging to your thighs, your stomach, tighter and tighter until yoga pants are your only way out of the house. If you’re worried about your significant other noticing, don’t bother. They don’t notice anything anymore, only whether or not there are more cookies readily available for consumption. Perhaps worst of all is that these chocolate chip cookies can be made so easily. 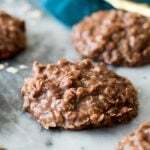 There’s no KitchenAid or any sort of electric hand mixer required to make these cookies. They can be stirred by hand, dirtying only two bowls. They do need to chill for 30 minutes, which would only serve as a deterrent if 25 of those minutes weren’t spent sneaking copious chunks of dough from the refrigerator. If you’ve made it this far, I fear it might already be too late for you. It’s too late for me, unfortunately, and I’ve made these cookies nearly a dozen times in the past two weeks. I’m swapping gym time for cookie time to keep my fridge well-stocked with dough, and the photo shoot for this post took three times as long as it should have because I kept eating the subjects. If you can, stick to the “best ever” cookies, stick to Grandma’s chocolate chip cookies and the family favorites. Those cookies are safe, they are your friends, made to be consumed by you. These cookies will consume you, instead. 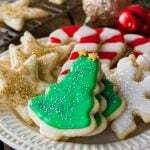 More Cookie Recipes You May Enjoy! Are they the worst or are they the best chocolate chip cookies in existence? 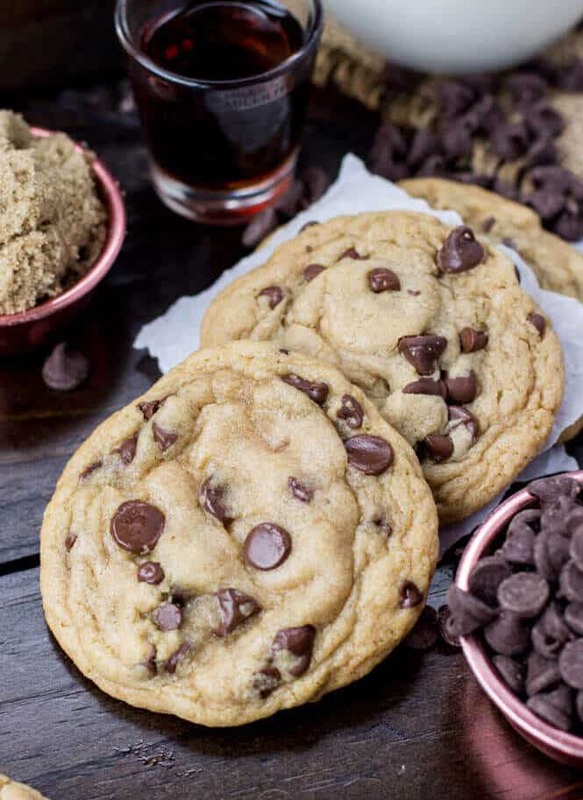 Either way, this easy, soft chocolate chip cookie recipe is insanely addictive. Recipe now includes a new step-by-step VIDEO and new tips in the NOTES section (below) to prevent your cookies from spreading too much or not spreading enough! In a large bowl, stir together melted butter and sugars. Add eggs, one at a time, stirring until combined. In a separate bowl, whisk together flour, cornstarch, baking powder, baking soda, and salt. Gradually add flour mixture to wet ingredients, stirring until completely combined. While the dough is chilling, preheat oven to 350F (175C) and prepare cookie sheets by lining with parchment paper (if you don't have parchment paper, you can bake directly on an ungreased cookie sheet). Scoop about 2-2 1/2 Tablespoons of cookie dough and roll into balls, making them slightly taller than they are wide. Place them at least 2 inches apart on prepared cookie sheet. Bake about 13 minutes (cookies will appear to be a bit underdone, but edges should be just beginning to turn golden brown). Allow cookies to cool completely on cookie sheet. 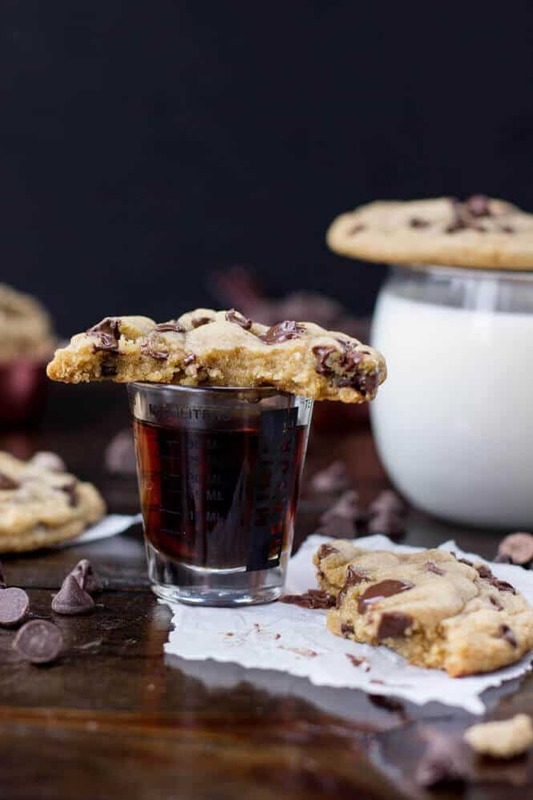 If desired, gently press a few chocolate chips on top of the hot cookies. 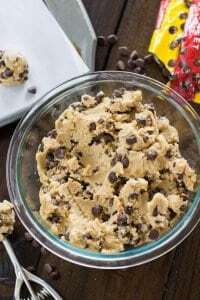 Keep unbaked cookie dough in fridge while waiting to put the next batch in the oven, and do not place cookie dough on a hot cookie sheet. *You do not want your butter to be too hot or it may melt the sugar and you'll have a very runny dough. 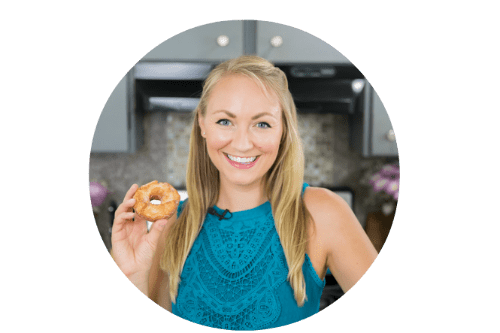 Best practice would be to cut the butter into about Tablespoon-sized pieces, microwave in 10-second increments (stirring after each) until it is just completely melted, and then allow it to sit for 5 minutes. 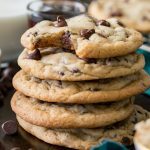 Why Did My Chocolate Chip Cookies Spread Too Much? The butter was too hot when you added your sugar, causing the sugar to melt and creating a greasy cookie dough that never stood a chance. You didn't add enough flour. If the flour was under-measured, your cookies could spread when baking. Your baking powder/baking soda was bad. These need to be stored properly and often will expire after 6 months, if yours is old, that could be the problem. The dough didn't chill long enough. If your dough is still very sticky after 30 minutes, let it chill longer. You put your cookie dough on a hot cookie sheet. It actually starts to melt before it can even begin baking. Your oven temperature is incorrect. Make sure the oven is fully preheated and at the correct temperature before baking your cookies. Many ovens do not report their temperatures correctly and run hotter or colder than they indicate. I purchased two inexpensive oven thermometers that I keep in my oven to make sure the temperature is right. Why Did My Chocolate Chip Cookies Not Spread In the Oven? Flour was over-measured. It's so easy to over-measure flour, especially when using cups rather than weight measurements. Never scoop your flour directly into your measuring cup, it packs the flour into the cup and you end up with way more than the recipe actually calls for. Instead, use a scale (this is the scale that I use) or use a spoon to pour the flour into your measuring cup and then level off the top with a straightedge (like the back of a knife). Your oven temperature could be incorrect. See above note, just as it can cause your cookies to spread too much, it can cause them to not spread enough! 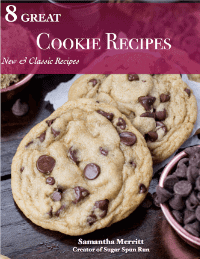 I originally published this chocolate chip cookie recipe 3/21/16. I am re-sharing it today with a new photo and a new video and some additional notes that I’m hoping will be helpful. While I’d like to update all of my photos, they’ve become so well-known that I have chosen not to replace all of them at this time. Omigerd! These are so insanely good. Just got the first batch cooled and had to eat one…..okay, maybe it was still a little warm. Now I’m trying to decide whether to share them, or tell my hubby that I “accidentally” put salt in instead of sugar so I can have them all to myself. LOL. 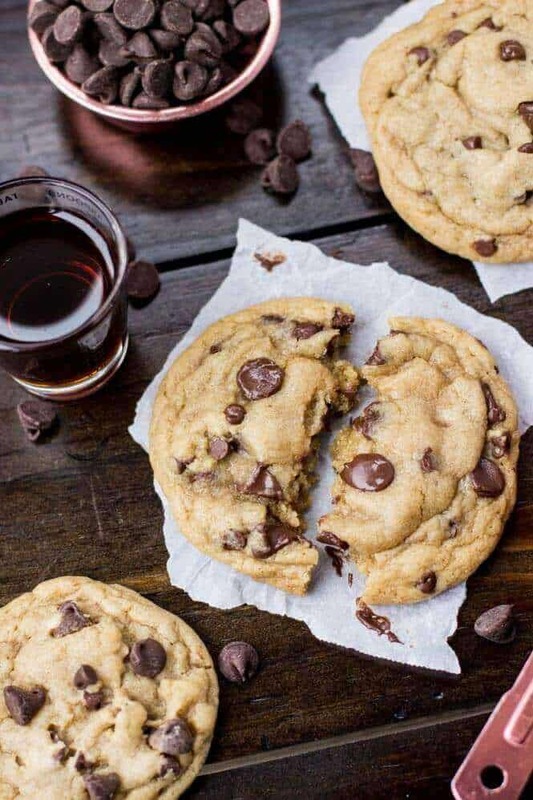 These are absolutely the BEST chocolate chip cookies. I didn’t have quite enough semi-sweet chips, but had a few butterscotch left over from another recipe, so the 1/2 cup I used those, then used 1 1/2 cups of the semi-sweet. Beautiful! 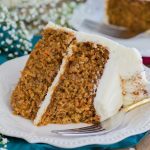 Sam, thank you for this recipe! 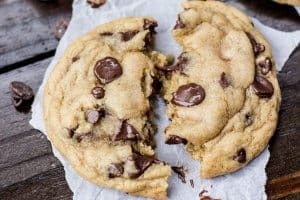 These are truly the best chocolate chip cookies. 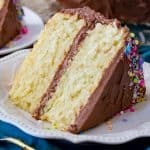 I’ve been searching for the best recipe for so long and your tips are so helpful. Thank you! 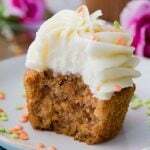 I made these today and substituted Trivia for both the white and the brown sugar (just cut the sugar measurements in half) and they turned out soooo good! This will be my new “go to” recipe. These cookies look so yummy and I’d love to bake em! But the problem is that I don’t have enough butter in my fridge. So, will these cookies still have the same lusciousness if I halve the recipe?? My cookies didn’t spread in the oven after following all the ingredients and the measurements. I used gluten free flour though coz my husband is a celiac. Could that be the reason? Hi Joan! I would guess that must be the reason if everything else was done precisely. can you double it ? Made these for my wife, and we loved ‘em!! 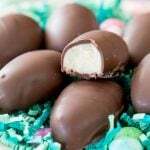 That hint of maple kept them moist, and was a tasty lil subtlety, enjoyed by both of us!! Thanks!! 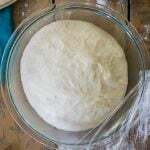 I love your receipes, my problem is that we don’t have all purpose flour, we have cake floannd self raising flour, can the all purpose flour be sustituted for cake flour as i and how much would I need to use? Hi Charlene! I would not recommend using cake flour or self rising flour. There would be some different substitutions that would need to be made here and I haven’t tested it so I don’t know what they would be. Exactly as advertised. Crunchy on the edges, divinely chewy in the middle. Home run. These. Are. Amazing. I followed the recipe exactly. Not substitutes and no shortcuts. They baked so perfectly. 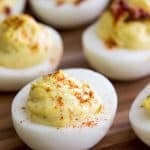 This is now my go – to recipe! I brought them to a meeting for my husbands work and they were gone so fast. THIS IS THE BEST. I try to always weigh my ingredients but my flour says it is 120g per cup which only comes to 390 grams. Should I use 390 grams or 415 grams (which would be almost 3 ½ cups)? Thank you for your help. I tried this recipe substituting butter 1:1 with Earth Balance Buttery Sticks and also 2 eggs swapped out for 2 flax eggs. The chocolate chips were organic dark (on clearance!) but not vegan. Followed the instructions AND watched the video and my cookies turned out great! “Just like the picture!” Nice recipe. The batch I made tasted a little too oily, may have been the substitute. Roommate has requested dairy butter for next batch!